Edit, convert and sort text, data and binary files with incredible speed. vEdit Pro64 can handle files of virtually any size, even 100GB or larger. I've never had another tool that has been so incredibly useful for so long, for such a wide variety of tasks! Edit any size text, data or binary file (even 100GB+) with vEdit Pro64. Standard vEdit supports files up to 2GB. Written in hand-optimized assembly language, VEDIT edits huge files quickly, such as 500+ megabyte files for a CD-ROM or DVD. vEdit easily handles any type of file you can throw at it, even those with strange control characters, corrupted files, binary files, database files, fixed-width files, and more. Various display modes show the file in its native format or any one you choose, including ASCII, Hex, Octal, Binary, and EBCDIC. 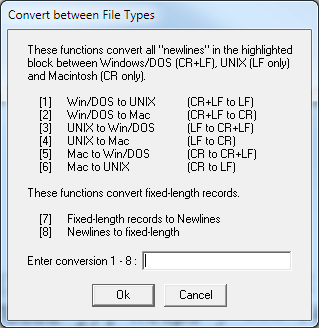 VEDIT converts between Windows/DOS, UNIX and Mac text files; and supports other useful conversions. 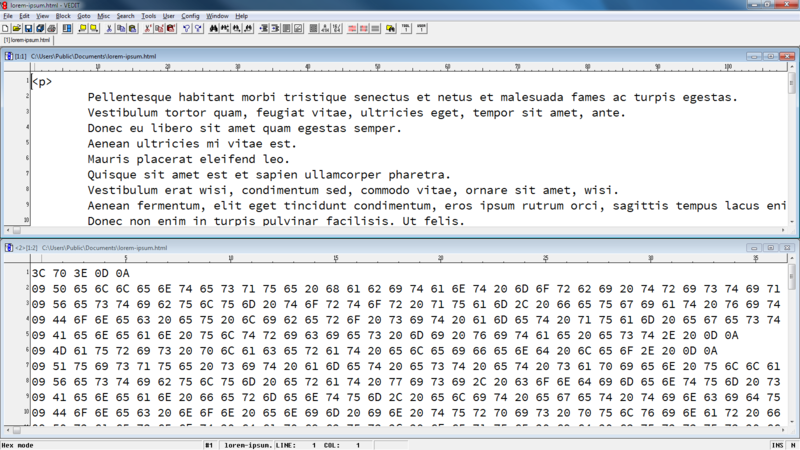 Pad a text file to make all lines the same length. 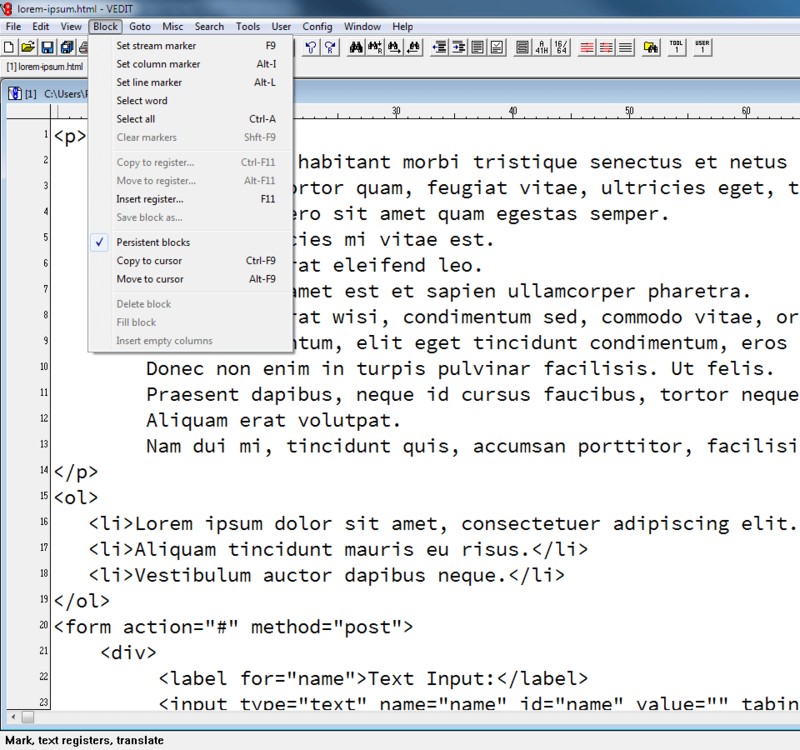 Strip trailing spaces from a text file. 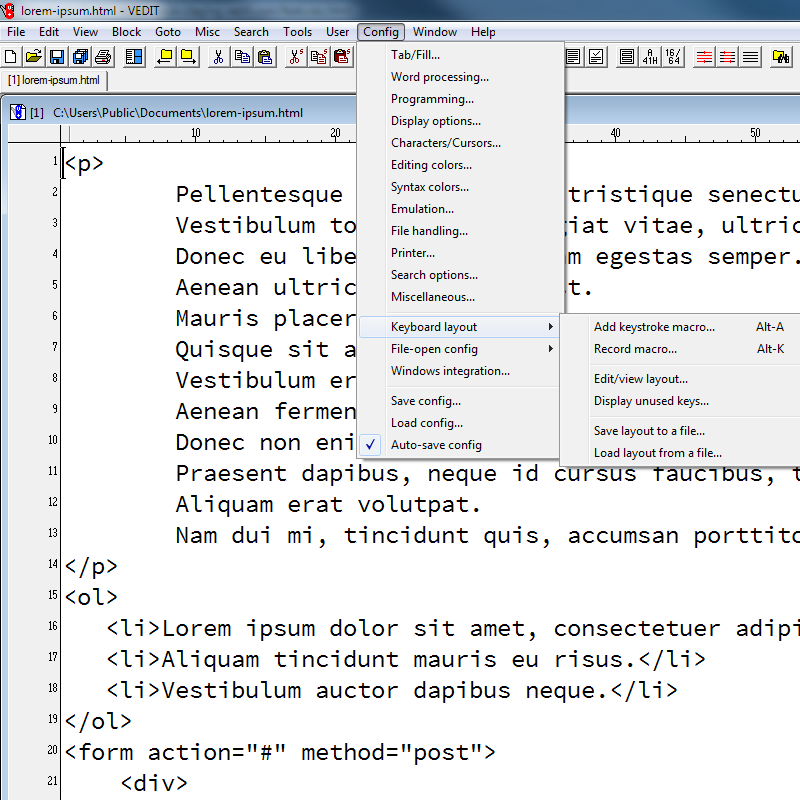 vEdit's extensive macro scripting/programming language includes over 400 commands. It also comes with a library of macros that you can use to accomplish complex operations. You can also create your own macros to extend vEdit's capabilities and automate routine tasks. Simply call macros from vEdit's COMMAND MODE window or the Windows Command Prompt. You can also assign macros to hot keys and to the customizable User Menu. Sort all or part of a file with incredible speed. vEdit easily handles massive file sizes (like 100GB+ with vEdit Pro64) that slow down or crash spreadsheet programs. vEdit is completely configurable. You can modify over 200 parameters and the keyboard layout. You can also modify the User menu, for example, to call your custom macros. Configure the keyboard layout to your tastes and add an unlimited number of keystroke macros. Multi-key sequences are also supported. 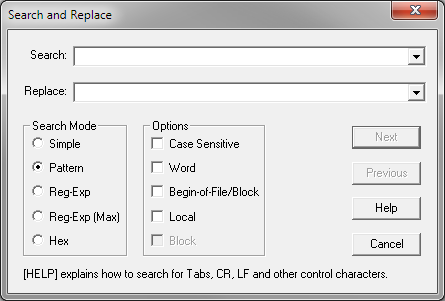 You can modify the keyboard layout interactively or load an an entire keyboard layout file. All of the "hot keys" displayed in the menu and dialog boxes update dynamically as the keyboard layout changes. 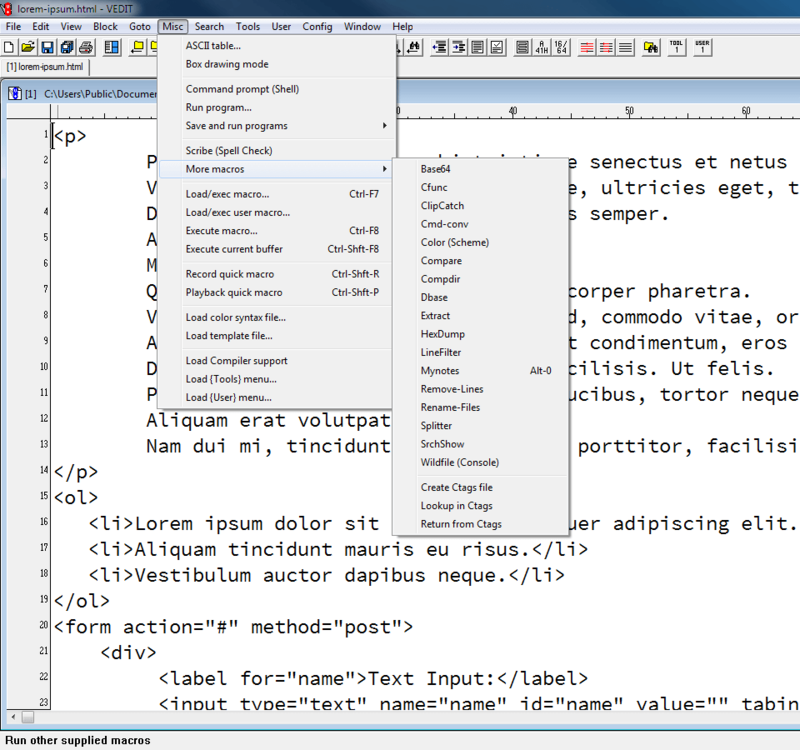 vEdit lets you perform a wide variety of operations on blocks of text or other content. 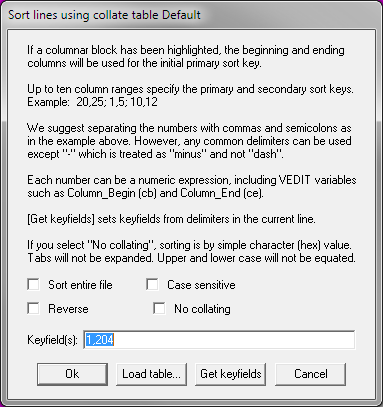 A block can be the current selection, a line, a column or the entire file. I now have an editor and keyboard layout that 'fits like a glove'.